Kunio-kun Nekketsu Complete Famicom Series has been announced for the 3DS. The collection will contain 11 games which include Downtown Nekketsu Monogatari (River City Ransom), Nekketsu Koukou Dodgeball Bu (Super Dodge Ball), Nekketsu Koukou Dodgeball Bu: Soccer Hen (Nintendo World Cup), and others. At the moment the collection is about 70 percent complete. It will be priced at 5,184 yen. 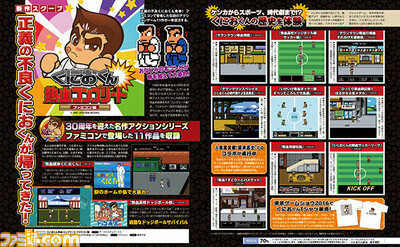 Kunio-kun Nekketsu Complete Famicom Series will be released on the Nintendo 3DS in Japan sometime this Winter. Next Post:The Last Blade is Now Available on Steam!